Ancient Books of Ys Part II picks right up immediately following the events of the first series. Obviously you will not understand anything that is going on if you don’t see that first. This sequel doesn’t disappoint either, except maybe with its length since I would have loved to see a lot more of this story. At the start of the story Adol finds himself in a land that is in even more misery and peril than the land he just saved from evil. The story takes place on the floating island that was sealed away from the rest of the earth to keep evil away. We saw flashbacks to this event in the first series. This land is called Ys, and here evil is in complete control and the people live in fear and misery as they are forced to offer sacrifices of their people to appease the monsters. The townspeople are initially wary and fearful of Adol but he is able to eventually make some allies and the plot unfolds to reveal the true villain behind all the evil and brings us to the inevitable final battle. Overall the story is much more complex than the previous one and doesn’t rely as much on the formulaic episodes it did before. It also has a much darker tone and more emotional complexity and drama. The action is pretty good but much like the first series, the battles unfold pretty much as they did before. There is a lot more special effects and magic than before which visually make the battles more interesting and exciting. The ending is a bit bittersweet as I was hoping for something different, but in a way is so typical of anime, especially from this time period. Most of the same characters return, though some not until the very end. Adol grows more as a character and shows a bit more personality and depth than he did before. We also get introduced to a new character, Lilia who is very interesting and gets a lot of screen time and we learn a lot about her and her past. The other supporting characters are even more cliché and cardboard like than they were in the first season. This is especially true of the new allies from Ys. The Goddesses Rena and Feena are disappointing too. This is mainly due to the length of the series I think. The villain is also not very well developed. He is very one dimensional and uninteresting. 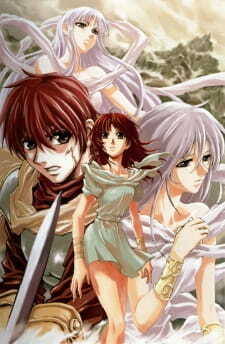 But overall this series is carried by the very good Adol and Lilia characters. The art is where this series excels over its predecessor. The characters look a lot better and more detailed. Gone is Adol's poufy hair and a more modern hairstyle takes over, much like we see in today’s shows. The backgrounds are still very exceptional like the first series. But the series does suffer with some inconsistency with the art. While it’s good, Adol and Lilia look at times to be different ages. In the beginning of the story Lilia looks like she’s maybe 9 or 10 years old, by the end she’s looking more like a teenager. Adol’s age and size seem to vary as well. That aside, considering the age of this show the art is really pretty good. Sound wise it is identical to the first series, same songs, same music and effects. Despite being a tad disappointed in the ending that was really just a personal desire. Overall this series is really good. I would have liked it to be longer but I give my recommendation to anyone who wants to see a nicely crafted fantasy adventure story.